The remains of Ardincaple Castle, in the coastal town of Helensburgh, stand on a prominent site overlooking the Firth of Clyde. Built on land which was owned by the Macauleys from at least the 13th century, it is said to incorporate an original 12th century structure. But the 11th laird MacAuley created a large castellated mansion in the 16th century which swallowed the earlier building. The MacAuleys abandoned the castle and, on the death of the last chief (a title regained in 2002), the MacAuleys sold the roofless ruin to the Campbells in the 18th century. It then passed to the Colquhouns of Luss in 1890. The castle was refurbished by its last owner, Henrietta MacAulay Stromberg, who died in 1931. A development company then turned the adjacent Tower Lawn into a housing estate. They would have demolished the castle too but the 1939-45 war intervened and the Admiralty requisitioned the castle. In 1957 they finally demolished the castle, leaving one tower standing. 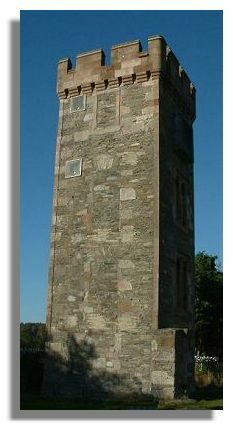 The tower now stands in a small children's play park. The tower was used up to the early 1990s as a navigational aid by nuclear submarines returning to Faslane on the Gare Loch, further along the coast and is still used as a marker by ships in the Firth of Clyde.